Sweet friends, want to join me in something new? Well, not really new…but new to this site! One of my favorite ways to read and study God’s Word has been to hand copy Scripture. I have been copying Scripture for about 3 years now and it, along with Bible Journaling, has completely changed the way I read and study the Bible. I love it so much, and hardly miss a day. Writing out Scripture was a Biblical practice! I am bringing my love for Scripture Writing to you, in the hopes that you will join me on this beautiful journey. The FROM THE HEART study will come out each month, Lord willing, and will be a topical study. During the month of August, we will be reading and writing about WAITING on the Lord. This topic is something that I know I need to reminded of each day. I have been in a long season of waiting, my friends. Let us be reminded that our waiting restores strength. God is far greater than any strength we could ever conjure on our own. He is always at work in us and promises that our waiting will never be useless. Psalm 27: 14 is a reminder of to us to WAIT for Him. Each of the Scriptures should take no more than ten to fifteen minutes a day to copy. Join me in spending fifteen minutes a day listening to God’s Word as He teaches us to wait on Him. Join me! If you have the FROM THE HEART PRAYER JOURNAL, that is a perfect place to copy down these Scriptures. If not, any journal or pretty notebook will do. Let’s do this together! Comment in the monthly thread on Facebook as we start a beautiful community around writing the Scriptures and hearing God speak to us and through us. 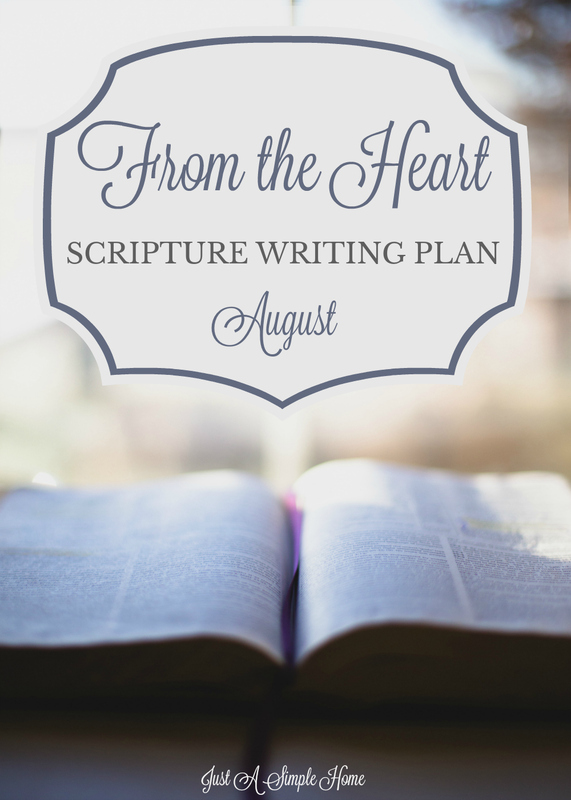 You can download your From The Heart Scripture Writing Plan for August HERE. Please share this post with your community so we can share how God is working through this community! I have never done scripture writing before but I am definitely going to do the list for August!! Thank you for sharing this!!! I am excited to do this because its not as easy for me to memorize verses as it used to be so this will probably help! You haven’t?! Yay, I’m so glad you’ll join then! What a great idea! With 6 kids I’m always distracted. This will be a great way to slow down and really focus on God. Wow! This is such a coincidence; Sarah @ Freedom is Hers is also doing hand-copying of Scripture as a 30-Day Challenge in August!! I’m doing a year of 30-Day challenges along with her, and this one is scheduled for October for me. Amazing to see it from 2 different sources so close together! Hi Colleen! I haven’t heard of her blog, but that sounds lovely! I can’t imagine they are the exact Scriptures, so I hope you are blessed by both versions! October is a great month to learn about waiting as well, isn’t it? Thank you for your beautiful download! I have only done a little scripture copying before, but my August is extra busy so I’d love something simple to add to my devotional time. I’ll be trying it next month! I definitely need to start this! And WAITING on the Lord is a tough one for me, so this was really perfect timing! Thank you for the push!! This is such a good idea! This is a great way to focus your heart on the Lord.